The Manaia, or spiritual guardian, is the profile of a Tiki. This is symbolic of being half in this world and half in the spirit world. Manaia's can be adapted with other symbols and stylised to communicate different aspects or meaning. 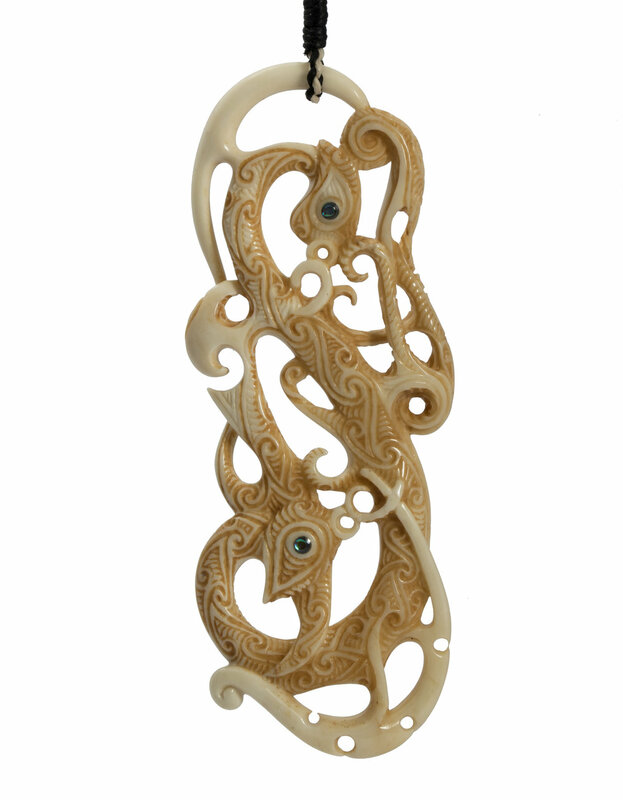 The carving is covered by the all-pervasive life-force which is symbolised by the koru covering the main body giving us the power to fulfill our virtuous wishes and benefit others. The koru symbol is common in New Zealand and is inspired by the unfurling of the new fern fronds. Meanings associated with this are new growth, new beginnings and awakening. The eyes are an inlay of Paua shell. Each eye has a natural 'pupil' in the inlay formed by the curve of the shell created through the way it has been sanded. The bottom of the carving is a stilized Tuatara. A Tuatara is an endemic reptile with baggy skin and spines down the back. Because of their spiritual association with the atua Whiro, whose realm was of things evil, tuatara were feared. Therefore his carving is symbolic of overcoming, destroying and eradicating all evil from our mind and therefore being free from negative external influences. True protection comes through our spritual development and cultivating minds of love and wisdom.